How do you Build a Laser with a Black Hole? The principal behind the lasing effect between the black hole and white hole horizons. Lasers. Very cool and exciting toys. They have also revolutionized science and technology. Through a comparatively simple process, photons are bounced backward and forward within an optical cavity. Stimulated emission from the quantum states of the material within the cavity causes more and more photons to be generated. Eventually a threshold is reached and laser emission results, producing a collimated beam of a defined wavelength. Yes it sounds ridiculous when we read: “Synthetic Black Hole Event Horizon Created in UK Laboratory” (ahem, one of mine! ), but it isn’t that far from reality. Drawing the reader’s attention to the word “synthetic”, we are obviously not talking about a real, bona fide black hole sitting on a desk in some professors lab causing all sorts of havoc to the space-time in some university campus! We are referring to a black hole “analogue”, or more precisely an event horizon analogue. In science terms an analogue is used to simulate a “thing” far more complex but demonstrates the physics behind that “thing” accurately all the same. Looking at the simulated Mars missions, we currently have a “Mars base”, the Mars Desert Research Station (MDRS) running in the Utah Desert, where a group of people get sealed away from the rest of the world for months on end. All in the hope to simulate what it is like to live on Mars. This is commonly known as a Mars habitat analogue. Black hole or event horizon analogues aren’t for people to live in. In the case of the laser experiment I mention in the above article, the event horizon is simulated when two pulses of laser light of two different wavelengths are fired through an optical material. The first travels slowly, the second faster. As the first laser changes the properties of the optical material behind it, the second laser pulse is slowed down. The second pulse can never overtake the first pulse; it is effectively slowed to a stop (relative to the first pulse). Sound familiar? This is a basic simulation of how an event horizon works as light tries to escape a black hole – it can’t. Hey presto! We have a simulated black hole, or as I’d put it, a “synthetic black hole”. So, experiments are being carried out on laser light to see how the event horizon within an optical material acts. Could it be possible to demonstrate things like Hawking radiation? Could particles, or photons for that matter, appear to jump out of the leading edge of the horizon? I’m not totally convinced this can be proven, but then again the mathematics may prove otherwise. OK, so there might be a possibility that an event horizon could be demonstrated in the laboratory using lasers as a method to simulate a black hole. Turning this idea around, could event horizons and our good friend Hawking radiation combine to create a type of laser emission itself? Using a Bose-Einstein condensate, a rather exotic substance itself, sonic waves could be generated to simulate an event horizon. Where one horizon is apparently pretty useless for laser generation, two horizons, side by side actually turns out to be fairly useful. In this case, a black hole horizon and a white hole horizon are required. 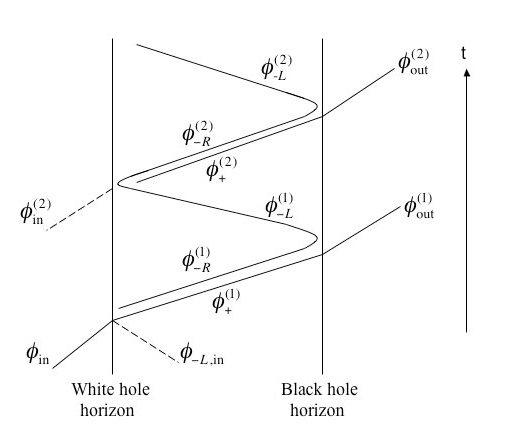 A white hole is very similar to a black hole (i.e. in cosmology, they will both have the same gravitational influence on matter – matter is attracted – and will therefore be indistinguishable to observers), but there are some very subtle differences at the event horizons of both. In this analogue substance, sonic waves that travel across the white hole horizon will have a negative and positive frequency component. After some blue shifting and red shifting (increase in frequency and decrease in frequency, respectively) on each “bounce” between horizons, the product waves will have greatly increased in amplitude. In fact, theoretically, the process is exponential, simulating stimulated production of waves, similar to a laser process. A theory about black and white holes also states that when a material is grabbed by the gravitational field of a black whole, it’s pulled into it and then outcomes from a relative white whole (the minus gravity of the black hole) in other distance or even the same but in other area of the universe.. Could this be simulated? Sun and only receives 25% of the solar irradiance (the cloud cover reflects the majority of the sunlight back into space and Venus is usually the brightest planet in the sky). appropriate? I wont need to sumit this just as before easily dont have to! does not surprise everyone ; ). thanks as part of your good website! Is this even possible ?? I doubt this. Good article though..
Nice article,thanks for the share. This Great Article , useful To all ! Previous Previous post: Daily Roundup: The Mars Curse and the Biggest Explosion in the Universe!